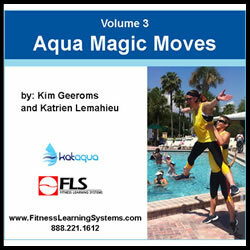 Katrien Lemahieu is back at it again for Aqua Magic Moves 3 teaming up with Kim Geeroms. Kim and Katrien (K2) provide a unique way to construct aquatic choreography that results in “magic moves” which can be used in choreography for the unfit through trained athletes. You can adapt these moves to your client base, intermix them into your existing chorography for an extra challenge, or use them to promote coordination to “train the brain.” There are so many options for using Aqua Magic Moves that you will never run out of choreography ideas and challenges. Over 50 videos to help you learn the moves!